A number of American media firms are to make a trip to the North next month to investigate trade relationships and off-shoring opportunities. The trade mission to Manchester, Leeds and Newcastle will look to foster partnerships between New England agencies and those in the Northern Powerhouse. 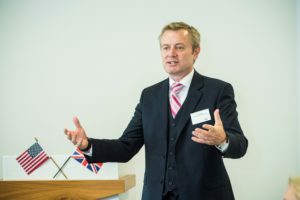 The mission, which will be led by the British American Business Council of New England (BABCNE) and accompanied by the British Government’s Consul General to New England, Harriet Cross, will see events in Manchester on 18 September, Leeds on 20 September and Newcastle on 21 September. Appeal PR's Paul Snape, who is organising events and meetings for the delegates in Leeds. The delegation will be received by senior business and civic leaders and Government representatives in the three UK cities, and there will also be the opportunity to schedule one-to-one meetings between the US agencies and UK counterparts. Rick McKenna, CEO of Boston-based advertising and brand agency Wallwork Curry McKenna, will lead the media delegation, which also includes PR, business development and video production agencies from Massachusetts. “The relationship between the UK and USA has never been more important for businesses on both sides of the Atlantic, and this is a chance for media agencies in Manchester and Leeds to meet potential partners in the USA,” said Paul Snape of Appeal PR and Great British Marketing, which has offices in both Harrogate and Boston, and who is organising events and meetings for the delegates in Leeds. Any agencies interested in meeting with Rick and his colleagues can make contact via the GreatBritishMarketing.com website and request an introduction.